The Nürburgring trackdays are officially back in this season, but the weather is still bad for driving on track and with the icy and snowy roads around the Green Hell is not hard to find somebody trying to have fun. Bad luck for this Nissan Skyline attempting a drift (he certainly wanted to show off for the crowd) but it collides and smashes the front bumper in the roundabout. Riding a supercar modified with the addiction of a few turbos must be a thrilling experience, and something not very unusual in the USA. This video shows the reaction of a chick getting a quick ride in an orange Lamborghini Superleggera producing 1000hp! By watching these pictures you might think about a fatal accident, but hopefully the worse has been avoided. The 38 years old driver of a yellow Lamborghini LP560-4 Bicolore due to the speed and poor road conditions lost the control and crashed roughly into a pole by hitting also a cyclist. 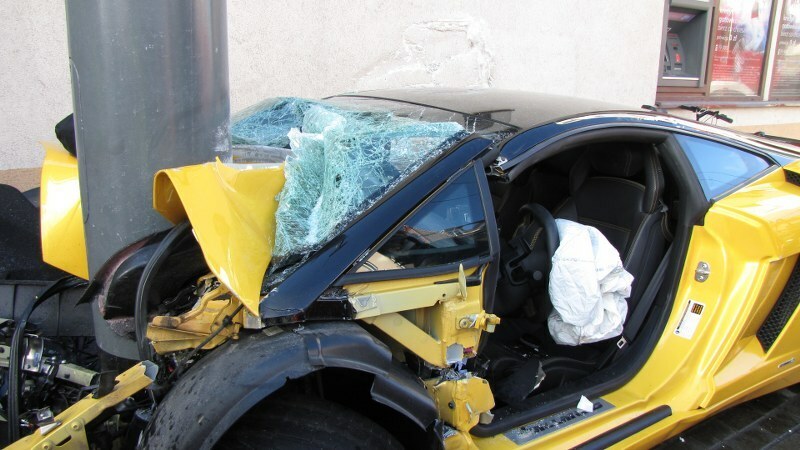 Altough the Lamborghini shows a German plate, the accident took place in Sopot, Poland. The driver and the cyclist have been sent to the hospital and reported several fractures to the legs. Everyone love cars shooting flames, then you will love this. A GoPro has been sacrificed and used next to the exhaust tips of a twin turbo Lamborghini Murcielago while driving at the new Circuit of the Americas, just wondering if the camera has melted, just look at the huge fire balls coming out the exhaust! One of the most unique, expensive and weird Bugatti Veyrons is back from Middle East to Europe, and it didn't took a lot of time before someone went out to spot it with a camera. The Bugatti Veyron L'Or Blanc has been seen in front of the George V Hotel, a very exclusive hotel of the french capital and through this video we may enjoy the quiet start up of the W16 engine, as well as many details of this very particular paint. This one-off is based on the convertible Grand Sport, it features high quality porcelain on its body and interior with a staggering price of €1.65m! We can find good car events even that small island called Malta. During the annual Paqpali Ghall-Istrina charity fund raising event in the airport was held the classic race Supercar vs Airplane, and involved a brand new Ferrari F12 Berlinetta and an Airbus A320. 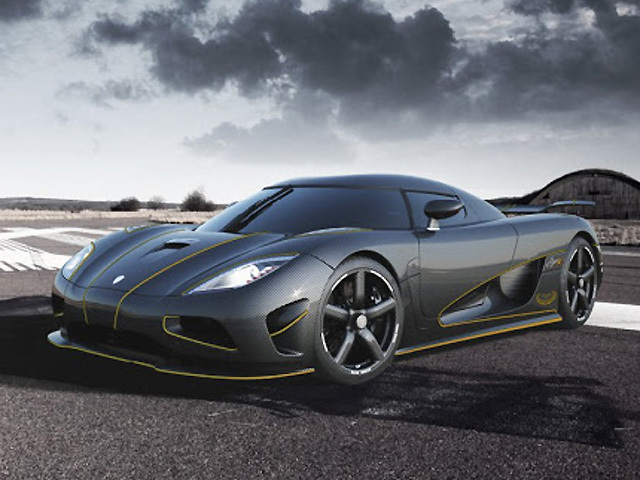 So what's faster, a 740hp supercar or an airplane during the take off? Just click play and enjoy! This story is unbelievable and weird at the same time because it's about a man purchasing and crashing a Lamborghini Murcielago LP640 the same day in California. Up to this point it sounds almost normal these days to hear about a crash right after the delivery, but this time the new owner decided to ran away from the accident site and abandon the expensive car for no reason! No insurance? Enough money to waste? Who knows.. according to the witnesses, the local autorities are looking for a blonde woman and a shorter man. Pushing a car at high speed on a track rather than on a public road is a much safer way to have fun, but that doesn't mean that the worse couldn't happen. There's always the chance to crash if you push the car to the limit and unfortunately that's what happened this time to race driver Miguel Villagomez behind the wheel of a Radical SR8, he loses the control of the car and crashes into the barriers and stops very close to the truck. He didn't got injured, but you can't deny that he has been very lucky in this situation that could have turned worse! Ferrari has released on their YouTube channel a new video regarding the LaFerrari and it shows the behind the scenes of the filming of the official video, pretty cool to see and to know that they have worked with the car in the open air and without any picture of the car being leaked before its official debut! Many of you have complained the Lamborghini Veneno for being too extreme under every aspect, especially for its staggering price tag of €3.0m + taxes. However, I think we all can find a large consensus when it comes to the spectacular sound of its 6.5L V12 engine. The Veneno has been filmed at the end of the Geneva Motor Show when it was ready to be moved away, in a festive (and alcoholic, by judging the crowd's reaction) atmosphere. We don't have doubts about the performance of the McLaren 12C, but it's impossible not to be surprised about this recent accomplishment on a drag strip. A completely standard 12C fitted with option light wheels, sports exhaust and carbon ceramic brakes has set a very impressive time of 10.55 seconds @ 134.56mph in the classic quarter mile, and it means that it's the second quickest road production car in the world (the record holder is still the Bugatti Veyron). To refresh your mind, the 12C has received several upgrades over the years and now its 3.8L twin turbo V8 engine produces 616hp and 599nm, pretty surprising to know that it has beaten also the record of the Lamborghini Aventador with nearly 100hp more and the 4WD, as you know the perfect feature for a quick launch. So, what happens when you drive a Porsche on track and suddendly it won't brake? Sounds like a brakes failure and it's just a second before something dangerous occurs. The learner looks scared and keep pushing the pedal... but which one? Just see the video until the end! Kudos to the instructor for his calm and diplomacy even in these situations! Sometimes when you want to get noticed, you bring your car to a workshop and wrap it with the most strange and flashy colours. In this case, the owner of this Range Rover wanted to get noticed but had too much money to spend, or more precisely, too much coins. The car has been covered all over with 57.412 coins and it's not certainly helpful to the 2.6 tons of weight, now it certainly weighs a bit more! Although F1 racing drivers are used to the extreme and incomparable sensations of a Formula 1 car, this video proves that even with a supercar they have huge fun. Just like two kids, Fernando Alonso and Felipe Massa keep smiling and laughing while sliding and pushing to the limit a Ferrari 458 Italia on track. Who wouldn't have a big smile while doing stuff like that in a Ferrari? All we know that the Aventador is a menacing flamethrower Bull, but we can't stop to see it redlining and spitting huge flames from the exhaust, it's just awesome or rather in the manner best suited, HOT! As you know, the Nürburgring is known also as the Green Hell, and with this nickname you can really understand how challenging and dangerous this track is.YouTube is plenty of videos about people overtaking their limits by trying to improve their lap times, often with a very negative result, but the video of today is totally silly as it might show the world's quickest crash in this track. And by quickest I don't mean an high speed crash, but a crash taking place just after 7 (yes, SEVEN) seconds on track. Classic supercars are amazing pieces of automotive engineering and history, most of them spend most of their time in a dusty garage because they're delicate and expensive. Hopefully there are people that actually drive them instead of leaving them under a cover, but if something wrong happens, it may be very expensive.. In this video a Ferrari F40 suddendly blows while accelerating in the straight of the track by leaving behind a cloud of smoke. The author of the video claims that the F40 broke one of the two turbos, and the main reason might be because it was tuned with an overboost as he claimed on FerrariChat. Supercars are meant to be driven, right? And with a pinch of madness it's possible to see people driving a supercar as if there were no tomorrow; I'm sure that you remember the mental WRC style driving with the Ferrari Enzo in the british countryside. Well, there's a similar video but taken somwhere in America and shows a modified Lamborghini Gallardo (which is definitely more suitable with its 4WD) having fun and sliding in the mud of a forest. Looks like huge fun, but I fear that all those pebbles weren't so good for the paint of the Bull! After a couple of years of concepts and teasing, Alfa Romeo debuts this year in Geneva with the final version of the 4C that is going into production. Many of us are wondering how does the tiny 1.7L turbocharged 4 cylinder engine sounds, and here in a world's first we get to hear its noise in a video taken while the car was being moved inside the Palexpo at Geneva. Of couse if you haven't seen yet the video below, I spent some time to film the 4C inside the show, finally Alfa Romeo is back to its roots with a good RWD sports car. Let's get to the point, this happens when you enrage the Bull, and you better be not on his way. A parking lot and the 700hp of the Lamborghini Aventador look to be a good mix to trash the tires! The Pagani Huayra is a very exclusive hypercar and even if you have the cash it's not easy to put the hands on one of these since the company has a 3 years (yes, 3!) waiting list due to the many orders received. However, now you have the opportunity to skip the queue and buy a Pagani Huayra finished in copper and bare carbon with black interior, delivered in Lebanon. The car shows less than 100km on the odometer and it's literally new and it can be yours for the reasonable price of 1.950.000€ + local taxes. See here the Pagani Huayra on sale. What's wrong with all these recent Ferrari 458 accidents? This time a Ferrari 458 Spider (apparently, registered the same day) on a wet day tries to overtake another car in which the passenger is filming the scene, but it slides and crashes into the guard rail, probably because the manettino must have been set in the wrong position with the traction control off. The occupants of the car sound really shocked about the accident, but hopefully the driver and the passenger of the Ferrari didn't reported any injuries. During an F1 race, the pit stop is a crucial moment in which the whole team in the pitlane must be as quick as possible and completely synchronized because every hundredth of a second gained or lost could make the difference for the driver. Apparently, in this video we may notice that this is not the same philosophy of Sauber team which is involded in what we may not define the world's fastest pit stop, but definitely the most weird and funny! 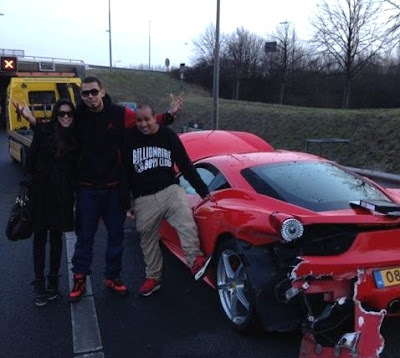 Right, if you remember just a couple of days ago the dutch DJ Afrojack has posted a picture of himself after that he crashed with a record time of 44 minutes his brand new Ferrari 458 Italia. Hopefully nobody got hurt except the back and front bumper of the Ferrari, but as you can see he poses with pride next to the wrecked car and he doesn't give a damn. After more than 1 year of absence of Adrian Sutil in F1, he's back for the 2013 season with Force India. Anyway, with this video we clearly understand that during this absence maybe he didn't had a nerve-wracking waiting for his comeback as he managed in any case to drive and have fun with high speed vehicles such as the Pagani Huayra that he has unleashed around the italian countryside and Modena racetrack, as we can see in the following video.